Analysis from experts on the qualities required to be a strong and effective president. FRONTLINE's report on Bush's personal religious journey and its impact on his life and political career. 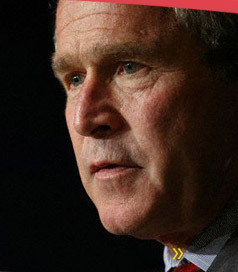 Those who know or have closely studied George W. Bush offer insights into the elements of his nature and character, and some of the decisions that have defined his presidency. ... Political correspondent to The New Yorker and reporter for "The Choice 2004." Some views and observations on George Bush's values, temperament and leadership, drawn from the dozens of interviews conducted for "The Choice 2004."